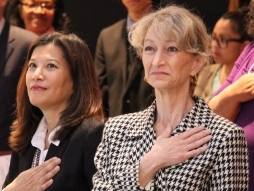 Established by Chief Justice Tani G. Cantil-Sakauye, the Power of Democracy Steering Committee guides and supports her civic education initiatives to further Californians’ understanding of their judicial branch. Highlights include spearheading the Civic Learning Awards for California Public Schools, convening two summits on civic education and launching the California Task Force on K–12 Civic Learning. The committee builds on recommendations of the Commission for Impartial Courts Final Report, Recommendations 37 and 43. The Chief Justice appoints members of the steering committee for two-year terms. Judicial Council Public Affairs staff support the steering committee. The Civic Learning Award for California public elementary, middle, and high schools, co-sponsored by California Chief Justice Tani Cantil-Sakauye and California State Superintendent of Public Instruction Tom Torlakson, spotlights successful efforts to engage students in civic learning and identifies models that can be replicated in other schools. The awards are presented to California schools based on the depth and breadth of their civic learning courses or programs. An expert panel of judges carefully selects the schools for the award. Each year, the three schools earning the Award of Excellence, the highest honor, receive a visit from Chief Justice Tani G. Cantil-Sakauye. Judicial officers recognize schools receiving Awards of Distinction and Awards of Merit. 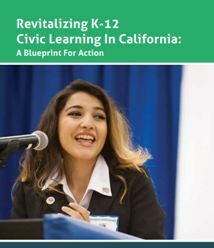 The California Task Force on K-12 Civic Learning was appointed by Chief Justice Tani G. Cantil-Sakauye and State Superintendent of Public Instruction Tom Torlakson. The purpose of the Task Force was to bring definition to the skills, knowledge, and dispositions our students need to be informed and engaged citizens and community members, including serving as jurors and court-users. The Task Force’s final report is a blueprint for how we can achieve these outcomes for all students in California. Informed state curriculum framework updates, which now indicate that the goal is to prepare students for college, career, and civic life, and provide vibrant examples of civic learning at each grade span. Inspired the formation of county-based Civic Learning Partnerships that collaborate with local school districts to support civic learning, inclusive of the judicial branch. More details about work of this task force is available on the State of California Dept of Education website.